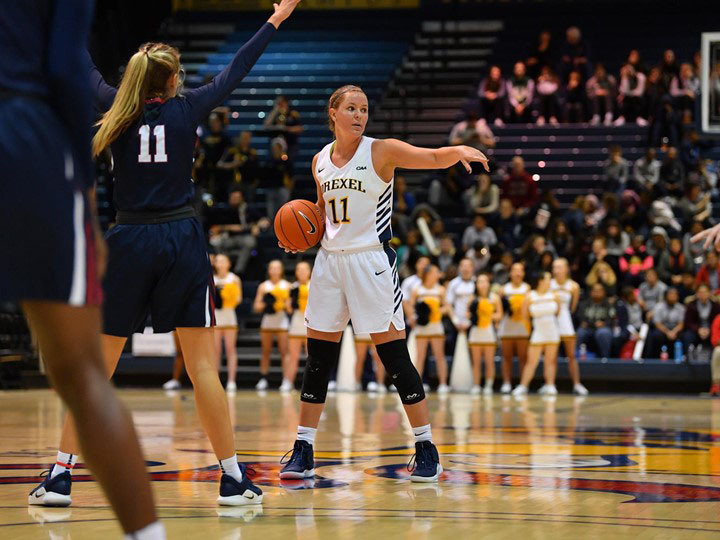 Junior Bailey Greenberg hit a game-winning layup at the buzzer while posting a career-high 26 points as the Drexel University women’s basketball team beat the Northeastern University Huskies Jan. 18, 61-59. The Dragons then defeated the Hofstra University Pride Jan. 20, 61-49. The team has won three straight games and is still undefeated on the road this season, posting a 7-0 mark. In Boston against the Huskies, the Dragons fell behind fast. Northeastern got out to an early 10-2 lead thanks to three-pointers from senior Jess Genco and junior Shannon Todd. Down 14-6, the Dragons went on a run to tie it up. Greenberg hit a basket down low and freshman Maura Hendrixson hit a pair of threes to tie the game at 14. Once again, Drexel’s defense, the number one scoring defense in the country, shined in the second quarter. Over the last five games, Drexel has surrendered only an average of 5.8 points in the second quarter. Northeastern only sank one bucket in the quarter, a three from sophomore Stella Clark. The Dragons scored nine points in the period, stretching their lead to 26-19 heading into the break. The offenses came alive in the third quarter, with each team posting at least 20 points. Greenberg led the scoring effort for Drexel, posting 11 points, while Hendrixson added another pair of threes. The Huskies kept close due to strong post play from senior Gabby Giacone, who posted six points, and seven more points from Clark. The Dragons took a nine point lead into the final quarter, but saw it quickly evaporate. Clark hit a three to open scoring for the Huskies, but Hendrixson responded with an open corner three for Drexel. However, Northeastern would go on to score nine unanswered points, highlighted by three from Todd, to knot the game at 51. A step back three from freshman Keishana Washington gave Drexel a 57-53 advantage with 2:15 to go. The Huskies stuck around, with junior Ayanna Dublin sinking two free throws and freshman Alexis Hill hitting a driving layup to tie it up at 57 with 1:19 remaining. Northeastern, once down by 14, would take the 59-57 lead on a pair of free throws by Todd. On the ensuing possession, Greenberg would tie the game up for Drexel on a driving layup in the middle of the lane. Northeastern got a chance to take the lead with the shot clock unplugged, but Washington was able to swipe the ball from Clark with one second remaining. A Drexel timeout, advanced the ball and gave the Dragons a chance to win it. Junior Aubree Brown inbounded the ball on the low post to Greenberg who drilled the layup as time expired for the win. Greenberg led the game in scoring with her 26 points while also posting eight rebounds. For her efforts, Greenberg was named an honorable mention for Player of the Week by the Colonial Athletic Association. The rookie Hendrixson had another strong performance for the Dragons, posting 16 points while draining five threes. Clark was the high scorer for Northeastern, posting 15 points along with three steals. Drexel shot well from the field, going 23-47 from the floor (48.9 percent), and 8-19 from beyond the arc (42.1 percent). The Huskies went 23-54 (42.6 percent) overall on the night, with 6-15 (40.0 percent) shooting from three. Against the Hofstra Pride, late game heroics weren’t necessary. After a close first quarter resulting in a 11-8 Drexel lead, the Dragons took control of the game thanks to a 13-2 run in the second quarter. The run was sparked by a step back three from sophomore Hannah Nihill, and featured both sophomore Mariah Leonard and Brown scoring four points each. Hofstra would break the run on a steal and score from sophomore E’Lexus Davis, but Drexel would score six more points to make it 30-17 going into halftime. Drexel stretched its lead due to strong shooting from beyond the arc in the third quarter. Nihill, Greenberg, Hendrixson and Washington all hit threes in the quarter to push the Drexel advantage to 48-30. In the fourth quarter, another three pointer by Washington and a layup from Leonard pushed the Drexel lead to 21. Hofstra made a comeback attempt, ultimately cutting the lead to 10, but in the end, the lead was insurmountable for the Pride. Three Dragons, Greenberg, Nihill, and Brown, had at least ten points in the game. For Hofstra, Davis led with 11 points. Both teams shot similarly from the floor. Drexel went 23-54 (42.6 percent), with 7-17 (41.2 percent) from deep. While the Pride went 20-48 (41.7 percent) for the day, including 5-14 (35.7 percent) from three. Drexel will return home this weekend for a pair of conference matches at the Daskalakis Athletic Center. The Dragons will take on the College of Charleston Cougars Jan. 25 at 7 p.m., then face off with the University of North Carolina Wilmington Seahawks Jan. 27 at 2 p.m.